With Yom Kippur in the rear view mirror, we hope you all had an easy and meaningful fast. Now in this festive month of one holiday after another, we're taking a Throwback Thursday comedy break and turning the clock back to 1956. That's 62 years ago. Back then, color TV was just beginning to become available and most programming was in black and white. Milton Berle was in his prime and on his way to becoming the king of television. 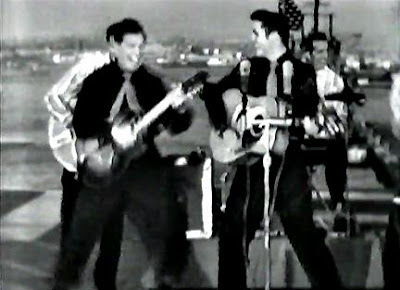 In 1956 he did a special with Elvis Presley on the deck of the U.S.S. Hancock in which Elvis introduced him as his twin brother Melvin Presley. After a couple of minutes of patter, they put their guitars to work in a rendition of Blue Suede Shoes.